The prime objective of the keto diet is to get into ketosis, so how do you know when you’re there? How long does it take to get into ketosis? How can you get into ketosis faster? How do you know if you’ve been kicked out of ketosis? These are all pretty natural questions after dramatically changing your diet with hopes of losing weight or improving blood sugar values. I mean, you want to know when it’s working right? How long does it take to get into ketosis? Can you make it happen faster? For ketosis to occur, your glycogen stores must be depleted, but how long that takes can vary from person to person. The average glycogen stored in your liver is roughly 70 to 100 g with another 400 g in your muscles. In a 2003 study published in the National Library of Medicine, it took 24 to 48 hours to deplete this storage and reach ketosis. This process may be expedited by exercise and fasting. In another study done in 2017 by the Obesity Society, those who were fasting reached ketosis in 12 to 36 hours, a time reduction of 25 to 50 percent. The effects of exercise are more difficult to quantify as muscle mass and the type of exercise performed can greatly effect glycogen use. For example, a study in Frontiers in Physiology published in 2011 found that 60 minutes of average cycling depleted muscle glycogen levels by 50 to 70 percent, while a single 30-second “all out” cycling sprint dropped levels 22 percent. -Limit carbs to 20 net grams per day or less. -Avoid snacking and/or small frequent meals. -Consume the proper amount of protein (too much protein can prevent ketosis). 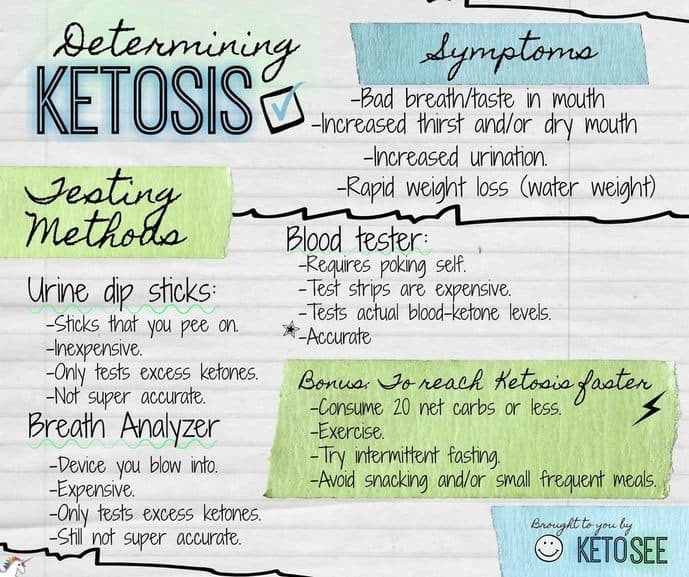 There are a few ways to determine if you’re in ketosis, including watching for signs of ketosis, urine dip sticks, blood testing, and breath analyzers. Watching for symptoms is the only method that doesn’t require some sort of supplies, so let’s start there. Bad breath- Many describe the smell as “fruity,” while others find it more akin to alcohol. No matter the scent you associate it with, keto is famous for causing bad breath. This is a result of ketones being expelled during respiration. Not everyone notices keto breath, but if you find yourself suddenly with an odd taste in your mouth, you may have reached ketosis. Side note here, if you opt for gum or mints, watch the carb content. Sugar-free is a good option. Increased urination and sudden weight loss- Glycogen happens to require water for storage—a whooping 3 to 4 grams. As a result, when you begin burning glycogen you also lose water weight via urination. This is why folks see a dramatic drop in weight when first starting the keto diet, but also find a need to use the toilet more often. Increased thirst- That same exodus of water weight often results in increased thirst and dry mouth (which really doesn’t help the keto breath). Fatigue, headache, and cramps- Commonly clumped together in the term, “keto flu,” insufficient mineral intake during keto can lead to fatigue, headache, dizziness, heart palpitations, and muscle cramps. This is not exactly a symptom on ketosis itself, but one often seen in dieters still feeling out the how-to of keto. You can avoid keto flu by finding yourself a good multivitamin and including dark greens and other nutrient-rich foods in your meal plan. For some, the symptoms of ketosis just aren’t pronounced enough to get that feel-good confirmation they’re doing it right. This is likely why ketone testing methods are so popular. Urine test strips- These are little test strips you dip in your urine. The strip will change colors depending on the level of ketones present. They are inexpensive and easy to use. One major drawback of keto urine test strips is that many become hung up on how dark or light their result is. It’s important to note that you’re testing unused ketones, the excess ones. This means even if you’re in ketosis, you may see a very light result if you’re active enough you’re using the majority of the ketones you produce. If you opt for the urine testing route, it’s recommended you just consider any color a good thing rather than stressing “how deep” into ketosis you may be. Breath analyzers- A step up from urine testing, breath analyzers simply require blowing into a tube-like device for about 15 seconds. Many users have found that these testers, much like the urine sticks, are not an accurate gauge of the level of ketones in your system, but they, again, will tell you if you’re in ketosis in general. Breath analyzers have the advantage of being a one-time purchase that don’t require peeing on things, but they also can be expensive (often between $100 to $200). Blood testers- The most accurate of testing methods, blood testers function much like glucose meters used by diabetics. You poke yourself with a lancet to draw a drop of blood, place it on a test strip, and insert it into a reader. They have the advantage of testing actual blood-ketone levels, not the unused over spill, but they also require poking yourself and at $2 to 3 a strip, they can become expensive despite the lower reader cost ($50 to $100) compared to breath analyzers. As you can see all four methods of determining whether you’re in ketosis have their downsides. Which is right for you will likely depend on your budget, the time you want to spend, and how confident you are in the process. How do you know if you’ve been kicked out of ketosis? This is harder to gauge. Blood ketone testing will tell you for sure. Urine or breath testing may alert you (a pattern of negative results would be more indicative than a single no-ketone test). Symptoms are a poor judge, as many symptoms of ketosis become less pronounced as you have been on the keto diet longer. You may see sudden weight gain (the water weight returning), but feeling less thirsty, needing to use the bathroom less, and a lack of keto breathe/flu are not necessarily signs you aren’t in ketosis anymore. You may have just become fat adapted. What does it mean to become fat adapted? That’s another topic for another time.